A parliamentary report of 1777 recorded parish workhouses in operation in Basingstoke (for up to 56 inmates) and Basing (30 inmates). Basing's parish workhouse was located on Church Lane, Old Basing, in what is now Church Lane House. 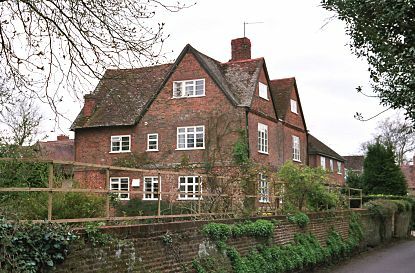 Basing former parish workhouse, 2004. Hampshire: Basing (2), Basingstoke (4), Bradley, Bramley, Cliddesden, Dean [Deane], Dummer, Eastrope [Eastrop], Ellisfield, Farleigh Wallop, Hartley Wespall, Herriard, Mapledurwell, Monk Sherborne, Nateley Skewers [Scures], Newnham, Nutley, Oakley, Pamber, Popham, Preston Candover, Sherborne St John, Shirfield [Sherfield-on-Loddon], Silchester, Steventon, Stratfield Saye, Stratfield Turgis, Tunworth, Up Nateley, Upton Grey, North Waltham, West Sherborne, Weston Patrick, Winslade and Kempshot, Woodmancot [Woodmancott], Wootton St Lawrence, Worting. Later Additions: Andwell, Mortimer West End (from 1866). The population falling within the union at the 1831 census had been 15,479 with parishes ranging in size from from Eastrop (population 69) to Basingstoke itself (3,581). The average annual poor-rate expenditure for the period 1832-35 had been £13,324 or 17s.3d. per head of the population. The Basingstoke Union workhouse was built in 1835-6 at a site to the east of the Basingstoke on the north side of the Basing Road. The architect was Sampson Kempthorne who was the architect of many early Union workhouses including those for the Andover, Droxford, New Forest and Winchester Unions. Basingstoke workhouse was broadly based on his model "square" plan which had a front administrative block, behind which four accommodation wings radiated from a central supervisory hub. The areas between the wings formed segregated exercise yards for the different classes of inmate (old/young, male/female etc.) In 1836, the Poor Law Commissioners authorized the sum of £7,500 for the construction of a building to accommodate 400 inmates. The workhouse location and layout are shown on the 1910 OS map below. From 1930, the workhouse was redesignated as a Public Assistance Institution. From 1948 it became Basing Road Hospital and the old buildings replaced. The site was sold off in 1983. Hampshire Record Office, Sussex Street, Winchester SO23 8TH. Very few records survive — holdings include Guardians' minute books (1835-1930); Committee minutes (1910-36); Ledger (1923-30); etc.